A new patent filing by Samsung hints at the inclusion of an in-display fingerprint scanner in the Galaxy Note 9. It was rumored last year that the Galaxy Note 8 would include the tech, while this year’s Galaxy S9 series was also reportedly set to feature the new sensors. 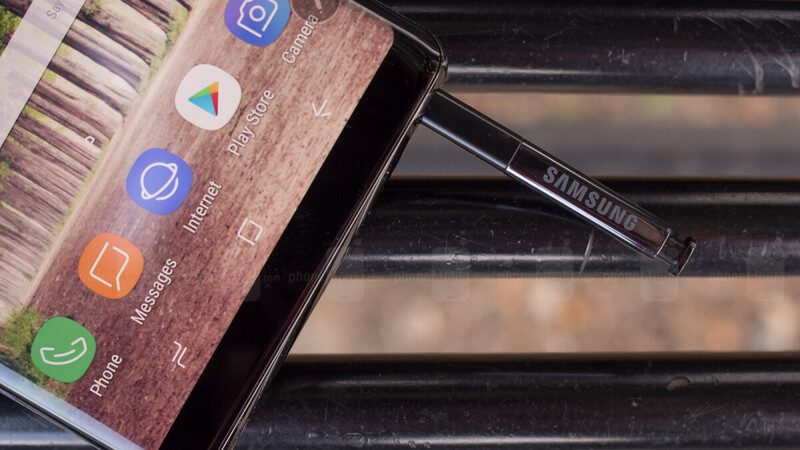 Despite this information being untrue, new rumors now point towards the Galaxy Note 9 being the device to debut the tech and, if Samsung’s patent is anything to go by, it may actually be true this time around. As can be seen in the sketches provided, Samsung plans to include the new in-display sensor towards the bottom of the front panel. When a user places their finger on to the AMOLED screen, this will then automatically light up the area directly below, allowing the sensor to scan the finger in question. Once this is done, the necessary authentication processes will be used and access to the device in question will either be denied or granted. Samsung’s Galaxy Note 9 is currently expected to be announced towards the end of August, as with previous Galaxy Note generations. This ultimately means that leaks surrounding the device should begin to pick up pace starting the end of June or beginning of July, with these hopefully providing clear information in regards to Samsung’s plans for the new technology. If the South Korean giant fails to consider in-display fingerprint sensors ready for the mainstream, however, it seems likely that Samsung will feature the scanners inside next year’s Galaxy S10 line. It was recently revealed that Samsung’s anniversary series is currently codenamed “Beyond” and should feature a similar look to the company’s current flagships. Interestingly, though, it could boast a display notch up top along with a new 3D-depth sensor and the in-display fingerprint scanner. They should better improve iris scanner by making it more faster and accurate and also make it more reliable to use it in almost all conditions. Should save the under the display fps for S10. They should improve the iris scanner and incorporate the in-screen FPS for the Note 9 as it is the higher end model. agreed, it's time to make some innovation in their top of the line model! It's already there. Plus secure. The iris scanner is already quick and accurate. There can always be improvement, but it's not like it's slow or misses often. Yup it is. But is it reliable in almost every condition like if you are in super dark room? Yes, it is. It uses IR. & what about if you wear shades or contact lenses? This will be basically be the bottom inscreen fingerprint scanner as oppose to whole screen. Samsung, focus on software! Your UI. Focus on updates, dont let it Take a year before you update newer android version, by the time you do update its not new anymore. Thats you main and biggest issue, thats the reason i wont Buy Samsung device until you can prove you can do better! Don't like Samsung's version of android you have a hundred other choices. Their UI is quite good. And they rewrite Android Doreen to the framework, for quite a few sets of hardware. That takes time. It's basically a fork. Thank you! Couldn't agree more. 4000 battery would be nice too. "it's time to make some innovation in the top of the line model" Lololololol Innovation like what the Lumia 950 /xl launched with in 2015???? If the Note series are going to use the same CPU as the Galaxy S series, it is better they move the launch date earlier. Otherwise, only wait for a few months later people can get the next generation CPU on the S series. Before Galaxy S7 Edge, people wanna get bigger screen and better battery life would look at the Note series. But now the Galaxy S series got the similar screen size as the Note and the Note doesn't provide much longer battery life. I feel something isn't right. It may be the same SOC, but the difference is there. The performance difference between the Note 7 and S7 was huge. I had the Note 7 until I was forced to turn it in, then replaced it with the S7 Edge. The wife had the S7. Both the S7 Edge and the S7 were much slower and choppier. Now, I have the Note 8 she had the S8. The difference is significantly smaller, but it's still noticeable that my Note is smoother and more fluid. I'd still like to see them design an Exynos specifically for the Note worldwide - the Note 5 was also much better than the eventual S7 Edge I got. I really didn't like that phone. Because it irritated someone. I actually made that my picture before I got the S7 Edge. Yes, they should add it on Note9 to make different phone, not just new S9+ with S Pen!